One of the biggest project management challenges is to meet deadlines and completing projects on time. 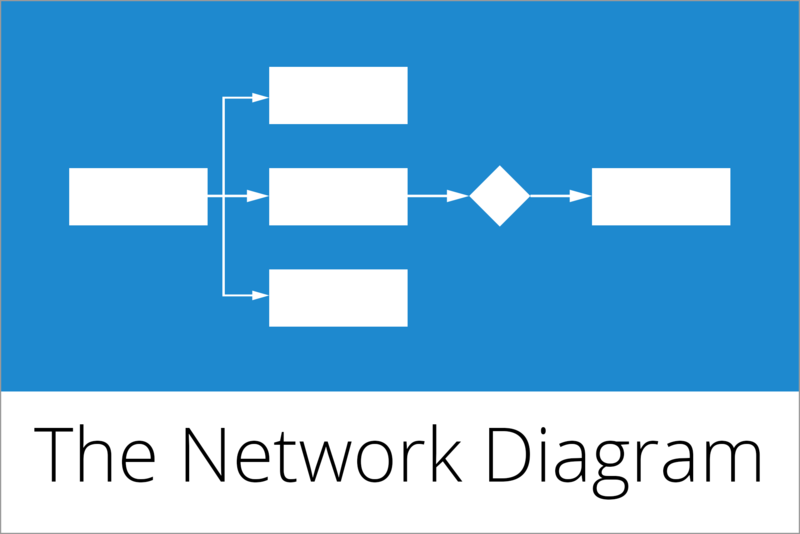 Creating a project network diagram can help you plan projects more accurately. A network in project management displays the duration of project activities and the dependencies between activities graphically or as a table. In a network, nodes (rectangles) represent activities and events. Arrows connect nodes with each other. Arrows represent the dependency between the activities or events. People often use the terms Work Breakdown Structure and a project network diagram synonymously. But there is an important difference between the two: A work break down structure enables you to view the project independently from its schedule and you visualize logical relationships in a hierarchical tree diagram. A network diagram also takes into account the chronological order of activities and uses dependencies to display them. 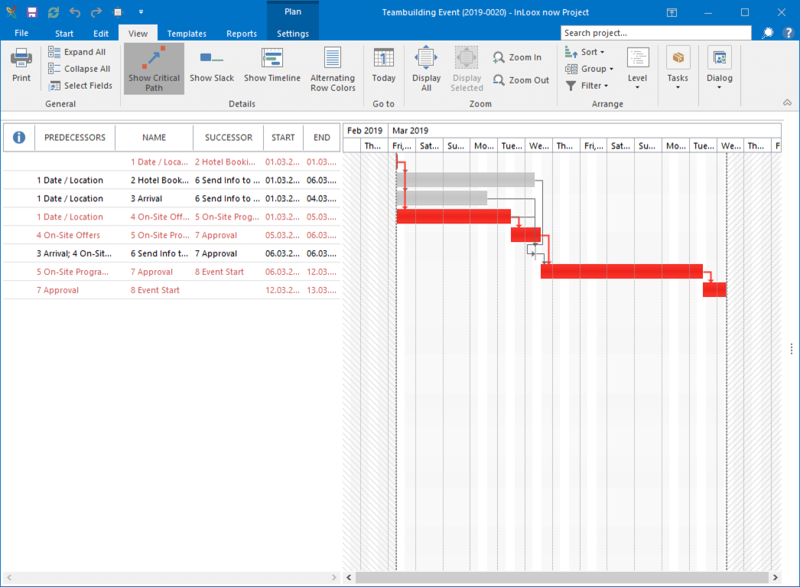 Bar charts such as Gantt charts are a special type of network. We’ve talked a lot about the theory but how does a network analysis actually work and what do you have to do? We’ll show you step by step how it works using a sample project – a teambuilding event. Step 2: Display all activities in nodes (rectangles) and enter the duration (d) into the node. EST = Earliest Start Time = When can I start the activity at the earliest? EFT = Earliest Finish Time = When can I complete the activity at the earliest? LST = Latest Start Time = When is the latest possible date to start the activity if I want to complete the project on time? LFT = Latest Finish Time = When is the latest possible date to complete an activity if I want to complete the project on time? Define the dependencies between activities. Predecessor and successor activities are linked by an arrow – this enables you to see which activity or activities you have to complete before you can start the next activity. If a node has more than one successor activity, the LOWEST LST is used >> activity #1 has 3 successor activities (activity #2,3,4). Out of the three successors, activity #4 has the lowest LST (=1) so the LFT of activity #1 = 1. 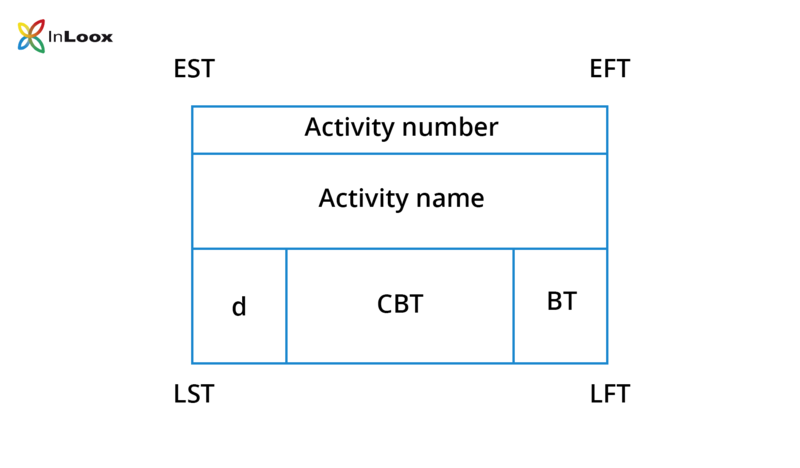 You can check whether your backward planning is correct if LST = EST = 0 for activity #1. The next step is to identify the cumulative buffer time (CBT) and the free buffer time (BT) for all activities. The cumulative buffer time indicates how much delay there can be in completing an activity before it jeopardizes the project’s completion. The free buffer time indicates how much delay there can be in completing an activity before it has an impact on the completion time of the next activity. The critical path is the longest path (i.e. the path with the longest duration) from project start to finish. The activities and milestones on this path have no buffer time. Which means that even the slightest delay of one activity, the project’s completion will be delayed accordingly. In a network diagram every activity (node) without any cumulative or free buffer time belongs to the critical path: CBT = BT = 0. In our case those are activity #1, #4, #5, #7 and #8. So the critical path determines the minimum project duration and enables the project manager to identify activities that are particularly risky should delays arise there. This helps them to devise countermeasures from the start. It’s important the they keep a close eye on the activities on the critical path. On the other hand, if you manage to complete a critical activity earlier than planned, you can decrease the duration of the project accordingly. The network analysis is a very precise method but that means that it is also pretty complex. For smaller projects with a smaller number of activities such as our teambuilding event, it’s feasible. But if you have a complex project plan with a lot of activities, it’s not only complex to create a network diagram but it’s also complex and time-consuming to keep it up to date. Which is why most use a project management software to create a network diagram. Though it’s still helpful to know how to conduct a network analysis manually as it helps you to understand your project plan better. The biggest advantage of a project management tool is that it calculates end and start times automatically according to the dependencies and constraints you’ve defined, calculates the critical path automatically and – most importantly – it takes much less time and effort to create a project plan. Back to Basics (Part 10): How to Create a Project Network Diagram - InLoox • Copyright 1999-2019 © InLoox, Inc. All rights reserved.